Ask anyone how they’re doing today, and there’s a pretty good chance you’ll hear this: “I’m tired.” But if you’re suffering from adrenal fatigue or burnout, your tiredness is on a whole other exhausting level from that of the average underslept Jane or John Doe. Just how debilitating your fatigue is depends on your stage of adrenal dysfunction. The same goes for what it will take to restore normal adrenal gland function and reclaim your energy and wellness. Ready to feel like your old vibrant self again? Here’s what you need to know about how the adrenals work, why they go haywire, and what to do at every stage of adrenal dysfunction to regain your vitality and strength. The adrenal glands are responsible for allocating resources in the body and preparing the body for stress. 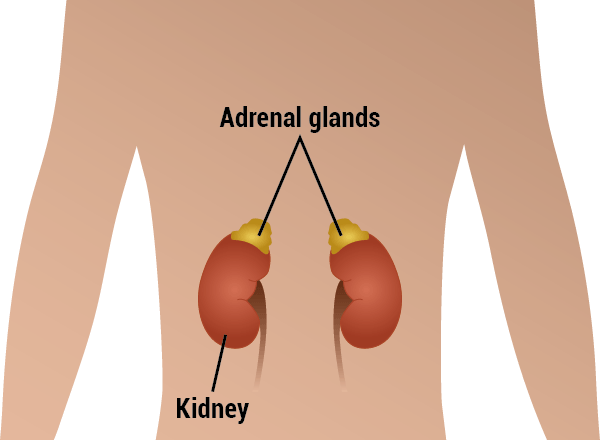 You actually have two adrenal glands; one located on the top of each of your kidneys. The middle portion of the gland secretes the hormone epinephrine, better known as adrenaline. The outer portion of the adrenal gland secretes cortisol. These two stress hormones define how you will react to stress of any sort. Cortisol is the hormone that directs the resources of the body to where they are needed for the given circumstances. When life is calm, cortisol secretion follows a gentle circadian rhythm that balances all functions in the body. It starts rising at four or five in the morning to prepare the body for the day: Rising cortisol is a trigger for waking up and getting going; it mobilizes resources for use during the day. As the day reaches its end, cortisol levels gradually decline. In the evening, cortisol secretion remains low. Lowered cortisol allows the body to focus on maintenance functions, immune functions, digestion, and healing. Night is when the body recovers from the stress of the day. In contrast, adrenaline is the “fight- or- flight” hormone. If a deer runs out in front of your car, for instance, you’ll experience a short-lived surge of adrenaline that accelerates your pulse, quickens your reflexes, sharpens your vision, and helps you think faster. During that brief period, other functions of the body, such as digestion, immune functions, and daily maintenance, become less of a priority and are placed on temporary hold. Assuming your car brakes work and the deer is fast, your mind considers the threat over and relaxes, and your body goes back to its normal affairs. During acute stress (the same deer-in-your-headlights scenario), increased cortisol secretion follows surges of adrenaline to offer backup: in the moment, elevated cortisol shifts the resources of the body away from everyday concerns and toward handling imminent conflict. And as with adrenaline, when you miss the deer, cortisol levels return to normal. The body is designed to handle conflict intermittently, but if the perceived threat is constant, staying poised at high alert 24/7 is quite destructive. 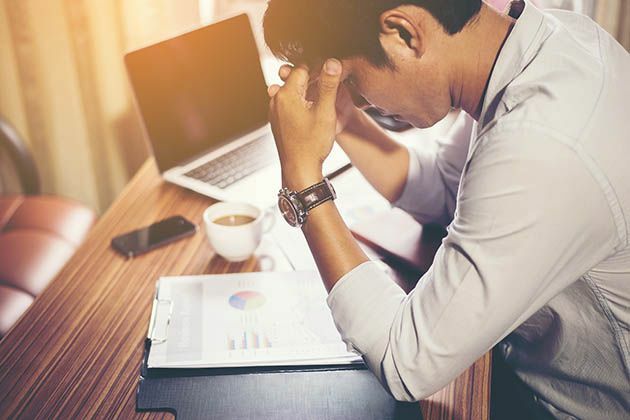 Unfortunately, modern life is often experienced as nonstop stress: Universal everyday stressors, such as maintaining a job, home, healthy relationships, and good finances, or just dealing with life’s red tape, can be major challenges. Add to that all the other life-disruptors that inevitably pop up, and being chronically stressed can become a normal state. Oddly, we humans make little effort to avoid conflict. Survival is our primary goal, and the adrenaline surge that keeps us in the game is actually quite invigorating. We like to be stimulated, as the scores of caffeinated beverages consumed every day suggest. But it can all become overwhelming — too much adrenaline is disabling. Chronic stress affects everything. The link between stress and diseases such as hypertension, autoimmune diseases, atherosclerosis, digestive dysfunction, and even cancer is well defined. Remember, cortisol follows adrenaline. When the panic button is pushed excessively, cortisol secretion is stimulated. You can feel cortisol when it’s up — it’s that revved up feeling that feels good initially, but once your body is overtaxed, it starts to feel uncomfortable. Eventually it catches up with you: elevated cortisol secretion at odd times prevents the body from healing, suppresses digestive function, and disrupts immune functions. This is adrenal dysfunction. Adrenal dysfunction goes by many names, including adrenal fatigue and adrenal burnout, but these terms are foreign to most conventional doctors. That’s in part because adrenal dysfunction is difficult to test for: When cortisol levels are measured at random, the results are typically normal. 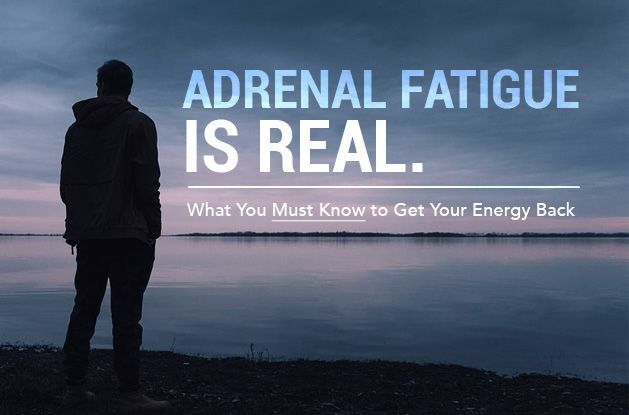 Most doctors don’t recognize adrenal fatigue as a “real” thing. Instead, they only recognize true adrenal disease — Cushing’s, which is usually caused by a tumor secreting excessive cortisol continuously, and Addison’s, characterized by very low cortisol resulting from destruction of the adrenal gland. Adrenal dysfunction goes from bad to worse the longer your stress remains chronic. As it progresses, symptoms become worse, and the more attention and dedication it requires to get the adrenals back in good working order. Use this guide to help determine where you might be on the adrenal dysfunction spectrum. Adrenal overdrive typically occurs in individuals who are driven. They like the stimulation that adrenaline provides, and tend to top it off with regular doses of caffeine. They drive hard throughout the day and into the night. Sleep is considered an inconvenience; self-induced late bedtimes and early mornings are the norm. In the beginning it all feels good, but as the body is taxed harder and harder, all systems start to break down and the person progresses on to stage 2 of adrenal dysfunction. Adrenal overdrive also occurs in individuals who have demanding, stressful jobs, and who are forced to work long hours without ever getting a break. Cortisol levels aren’t yet impacted, but there are early warning signs that the body is breaking down and being asked to keep pushing harder. Unfortunately, early signs tend to go ignored. But if corrected early on, this stage of adrenal dysfunction will normalize quickly. Energy levels: You’re a type A chronic overachiever or workaholic who is constantly driven. You charge forward from rising in the morning, and live on caffeine and adrenaline until late in the evening. You regularly burn the candle at both ends. You’re continually wired, but not tired. When you do become tired, you learn to push through it. Sleep: Despite your drive, you’re still able to fall asleep and get restful sleep when you finally hit the bed. Sleep time, however, is usually cut short, because you tend to rise early and stay up late to get more accomplished. Body temperature: Your internal thermostat is turned up — you feel overheated much of the time while awake, and have to sleep in a cool environment. Reproductive function: Your reproductive functions are normal or mildly dysfunctional (mildly irregular menstrual cycles and lower libido). Blood pressure: You may have high blood pressure and elevated pulse rate. This is the most common stage of adrenal dysfunction. After burning the candle at both ends for some time, the body is starting to wear down. It is characterized by dragging through most of the day, but becoming wired, hyperalert, and agitated by evening. I call it flipped adrenal function because it’s the opposite of normal (energized by day and drowsy at night). Someone with adrenal fatigue is tired before the day gets going. As the day progresses, they generate more and more adrenaline to push through exhaustion. They often also depend heavily on caffeine. Cortisol secretion follows adrenaline, and by evening, after a meal and a bit of respite from the stress of the day, a second wind kicks in. By bedtime, the person is wired and agitated, and can’t fall asleep for hours. After a poor night’s sleep, they drag out of bed the next morning, and the cycle starts all over. Energy levels: You’re typically dragging in the morning. 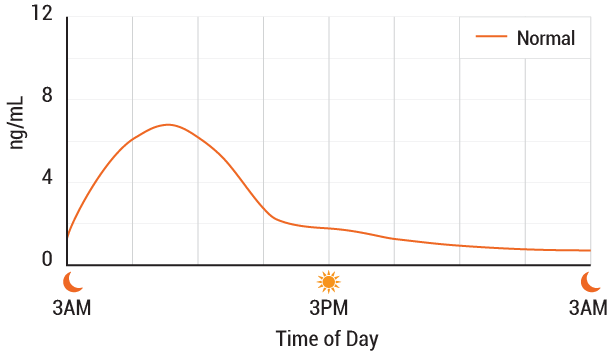 You experience a lift in the early afternoon, followed by a lull at about 5 pm. You get a second wind in the evening, and your body goes into full alert. By bedtime, you’re tired but wired and struggle to get to sleep. Sleep: Sleep is often restless and of poor quality. Calm and sleep often don’t occur until early morning when cortisol slumps (but not always). If attempted, you’re often able to take a nap in the middle of the day. Body temperature: Your internal thermostat is dysfunctional — you get cold easily, but sometimes are hot when you’re wired (when going to sleep). You tend to sleep cool with light covers initially and increase your covers later. Reproductive function: It’s erratic — that may mean low testosterone in men and irregular and sometimes heavy periods in women. Blood pressure: Your blood pressure tends to be high, with a high pulse rate. If intense stress is chronic long term — meaning not just an occasional stressed day, but months or years of stressed days — adrenal burnout or flat adrenal function can occur, resulting in chronically low cortisol levels. In this stage, the body continues to be driven by adrenaline, but cortisol secretion starts to wane and go flat. The body is exhausted and just can’t keep up anymore. Total collapse is the inevitable consequence — even excessive rest will not restore balance. Adrenal burnout is often associated with chronic illness. High cortisol levels associated with stages 1 and 2 disrupt immune function and set the stage for many types of chronic illness. Once immune dysfunction becomes chronic and illness becomes established, a vicious cycle of stress occurs that deepens the degree of chronic illness and adrenal dysfunction. Here, top signs you have adrenal burnout. Energy levels: You’ve used up all your reserves. Exhaustion is your normal state; energy is absent. You are dragging from morning until night. You’re hardly able to get out of bed, and experience extreme fatigue throughout the day. Sleep does not improve your fatigue. Sleep: You sleep excessively, but it’s dysfunctional and not restorative. You go to bed tired and wake up tired. Body temperature: Your internal thermostat is broken — you can’t get warm and are cold all the time. Reproductive function: Your reproductive function is low — men commonly have low testosterone and in women, periods are dysfunctional or absent. Blood pressure: You have low blood pressure, low pulse and, not surprisingly, depression. The first step for recovery from any of the adrenal dysfunction stages is removing the stress factors from your life. For those in stage 1 adrenal overdrive, sometimes it’s just a matter of simply backing down on life a bit and allowing the body to recover. Stages 2 and 3 require a more concerted effort of adrenal recovery. Wherever you are on the spectrum, these tips can help get your adrenals back to normal function. Learn to distinguish between real threats and perceived threats. Real threats are physical. They can include visible threats such as trauma and illness, but also invisible threats such as poor diet, accumulation of toxins, and stealth microbes. Perceived threats are mental. These are things your brain perceives as threatening, such as marital stress, job stress, current world events, or intense drama on television, that can only threaten your health by causing adrenal dysfunction. They can drive adrenal dysfunction as much as physical threats. Control the threats you can. Sometimes it’s hard to completely escape physical threats, but you can escape perceived threats anytime — it’s a matter of turning them off or at least turning them down. Focus first on the things that are easiest to control: media and entertainment. Avoid depressing news that you can’t do anything about: turn off the news alerts on your phone, limit your time on Twitter, stick to romcoms or the latest Pixar release on movie night. However you can filter your entertainment to include music and visual stimulation that is positive and uplifting will help limit stimulation that drives adrenaline and give your adrenals a break. Live solely in the moment. This is one of the most important keys to well being in general — admittedly however, it is often easier said than done. Even so, the more you can focus on the moment at hand and your personal well being in that moment, the less stressed you will feel. Zero out your adrenaline levels 2-3 times daily. All it takes is 10-15 minutes of focused concentration and deep breathing. Make a habit of finding a quiet place, putting your feet up, and giving your brain a deserved break from worry and frustration. Doing this isn’t hard — making the time for it is the biggest obstacle. Though minimizing causative stress is the ultimate solution, modern herbal therapy can enhance adrenal recovery. 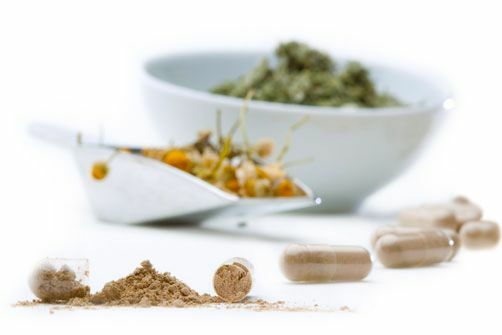 Two categories of herbs — adaptogens and nervines — are particularly beneficial for the recovery process. Adaptogens are a special class of herbal substances known for balancing and restoring adrenal function. Adaptogens also enhance immune functions and improve mood and sense of well-being. Nervines are tonics for the nervous system. These herbs promote calm and restore balance to nerve system functions. This simple guide can help you determine which herbs might be most beneficial for you when paired with the right lifestyle changes based on your stage of adrenal dysfunction. Take calming adaptogens and nervines such as Magnolia Bark (Magnolia officinalis) and Amur Cork Tree (Phellodendron amurense) in the evening to wind down. A good calming adaptogen choice: Ashwagandha (add l-theanine, an amino acid in green tea that promotes calm). For occasional sleeplessness, Bacopa and Passionflower are good choices. Caffeine is generally well tolerated, but don’t use it within six hours of your bedtime. Remember that preventing adrenal overdrive from going too far is a matter of letting up on the accelerator. It takes conscious effort to inject more calm into the day and start winding down earlier in the evening. It’s a matter of finding just the right amount of drive to make life work. The payoff is improved focus and concentration, better health, and enhanced well-being. To promote normal sleep, try Bacopa, Passionflower, and Motherwort. Recovering from Stage 2 takes a concerted effort to reduce stress factors, promote a calm state of being, and maintain low adrenaline levels. Low intensity exercise in the morning or afternoon is rejuvenating. Afternoon naps before 3 pm are restorative. Circadian rhythms should be respected, with well defined and regular bedtimes, and waking with the sun as opposed to an alarm clock. Caffeine should be avoided. Combining energizing and calming adaptogens along with nervines is important. Take calming adaptogens plus l-theanine both in the morning and evening to promote optimal immune functions. Good choices include: Cordyceps, Reishi and Ashwagandha. Good choices for energizing adaptogens: Rhodiola, Eleuthero, and Panax ginseng. Some people find these to be too stimulating and that they interfere with sleep. If energizing adaptogens are tolerated, add a low dose of licorice (50-100 mg twice daily) for adrenal recovery and restoring normal blood pressure. Nervines can help with sleep, but should not be used habitually. Vitamin D is important for many functions in the body, but it is also a steroid molecule that provides similar benefits to cortisone. If your vitamin D level is <20 ng/mL, doses of 5,000 units per day are typically recommended. Have your levels checked several times a year by your healthcare provider. Recovering from Stage 3 is a delicate process. It must include a comprehensive approach for chronic immune dysfunction that is ubiquitous and restores homeostasis to hormone systems in the body. Rest is essential, both physical and mental, but low intensity exercise during the day is beneficial. Caffeine should be avoided. Just How Reliable Are Lyme Disease Lab Tests?